The third main food group, after chocolate-covered raisins, and chicken pot pie, as many of you will remember. 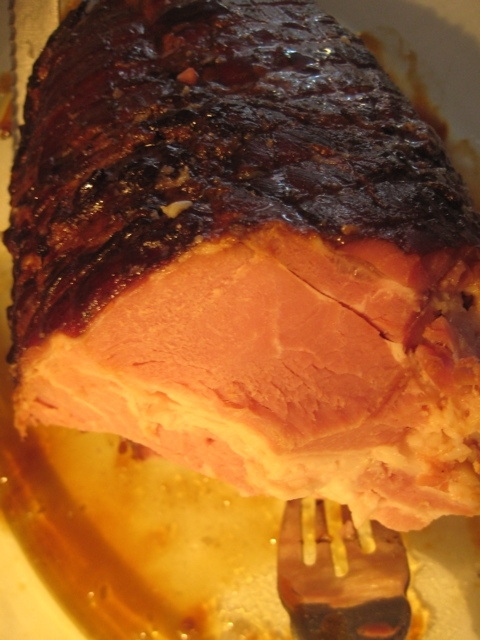 This ham came from Baczynsky Brothers Meat Market on Second Avenue in the East Village. It’s called a “city ham” and is boneless and sold whole, for about $20. This place is well worth visiting even if you’re not planning to buy ham – it was packed on the Saturday before Easter Sunday. There was an entertaining colloquy going on between some old duffer who had been sent to pick up his half leg of lamb and the butcher who claimed to have no record of it. We got a long long skinny sausage to nibble on, as well as an extremely, extremely tasty ribeye… worldbeating, if not as mustily aged as some. But back to the ham. We covered it with a mix of melted brown sugar and maple syrup and put in the oven for an hour at 350 degrees. It came out meltingly (duh) delicious, but still a bit too salty-hammy for my taste. So the next day (today) we melted more brown sugar into maple syrup and did a second glaze. Victory. Absolutely kingly, served with Mestermacher rye bread and butter, plus brussels sprouts and a bottle of Morgon which valiantly held the course against all this ridiculousness. And there’s still plenty of the ham in the fridge for snacking. ha, cheeky. white wine won’t kill you every now and then, by the way. Oh Man, that place does RULE… why i don’t go there weekly, in fact why we don’t stock the office fridge with their choice pork products is beyond me…. Previous Previous post: Your business card is CRAP!